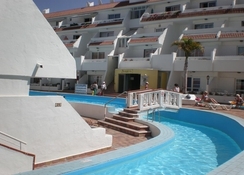 Las Floritas Apartments is located in the heart of Tenerife’s popular tourist resort, Playa de las Americas, between Costa Adeje and Los Cristianos. The modern apartment complex features 179 fully-furnished apartments, just steps from the sandy beach of Las Palmeras and the entertainment area known as Veronica’s Strip. If you’ve got the kids in tow, the hotel is just 10-minutes from famous Siam Park too – so you won’t be short of things to see and do. 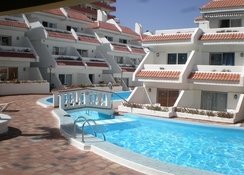 Las Floritas Apartments has a swimming pool, a large solarium area and a café bar. The accommodation is also only eight minutes’ walk from the beach area of ​​El Cabecito, where conditions are excellent for surfing. Equally, nearby you can find several sports facilities such as the Antonio Domíngez Municipal Olympic Stadium and the Club de Golf Las Americas for those wanting to stay active, in addition local restaurants, terrace bars and shopping centers to browse. 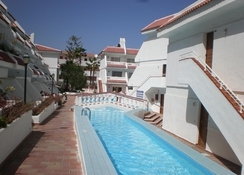 Las Floritas Apartments makes for a serene stay, especially with its river-like swimming pool that surrounds the hotel. 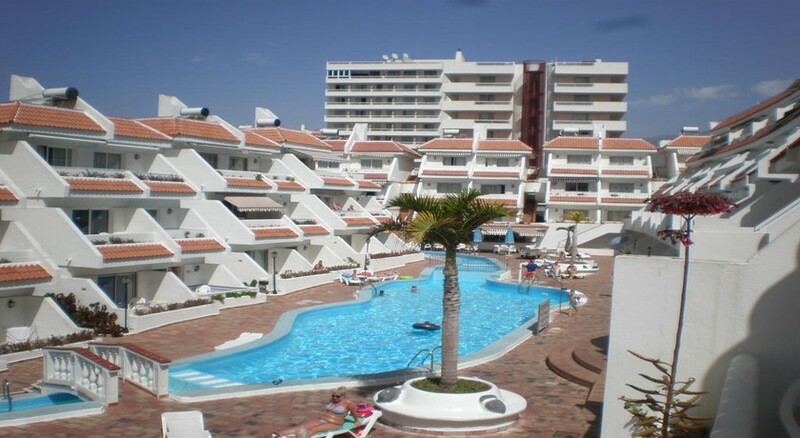 Centrally located, Las Floritas Apartments is only 500m from Las Palmeras beach. Veronicas, the lively strip in the centre of town is also only 400m away, ideal if you want to head out for entertainment. The famous Siam Waterpark is just 10-minutes away and the hotel is surrounded by lively shops and restaurants and bars, which are all located within 3 minutes walking-distance. Tenerife South Airport is 19km away. Las Floritas Apartments has 179 fully-equipped rooms in total, spread across five buildings — the main building has three storeys. 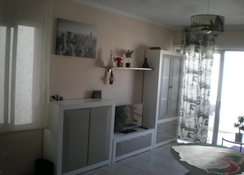 It has two sets of rooms; One Bedroom and Two Bedrooms apartments. 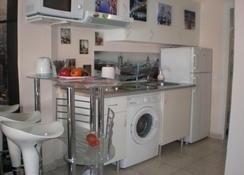 All the rooms are furnished with a kitchenette, fridge, electric hob and toaster. The rooms also have private bathroom with shower, TV with satellite connection (chargeable), safe deposit (chargeable), terrace/balcony and living room fitted with a sofa bed. Rooms are colourfully designed and have wooden furnishing. They are spacious and clean, and offer beautiful views of the surrounding and the pool area. The poolside bar serves alcoholic and non-alcoholic beverages, and some light bites if you fancy a snack. The area surrounding the hotel, however, is popular with tourists and hosts a number of restaurants and bars. Explore Indian food at the Krishna Tandoori, Chinese cuisine at Restaurant Hua Du and Lebanese, Mediterranean and Middle Eastern cuisine at the Balkonen Restaurant. Las Floritas Apartments has a reception desk that caters to guests 24 hours a day and offers tourist information, safe, ticket sales, currency exchange and wake up service. It has a cafeteria bar and a circular outdoor pool open all year round that offers lifeguard service. Had a great stay at Las floritas. Really great complex, comfortable, peaceful, clean couldn't have asked any more. They are more in the basic side but everything you need to enjoy your holiday. We stayed in a 1 bedroom apartment which sleeps up to 4 people. There was plenty of hot water for the two of us at all times of the day. The room was serviced often enough that I didnt think about it. At no time did I feel the room should have been serviced more frequently. The pool area was cleaned often and the pool itself is clean and quite large with two deep main sections 1.4-1.6m deep and smaller shallower sections which form a kind of lazy river round one apartment block, I wasn't travelling with children but I imagine they would find the pool to be good fun. At 10am we had the pool to ourselves. The furniture and fittings are mostly a bit tired but all very functional with enough kitchen items to get by. A safe is provided for 20euro per week. The bar hasn't been open much if at all whilst we have been here but the shop in reception sells chilled beer at reasonable prices. There has been no noise issues at all, some of the other issues mentioned in other reviews have been present but as they are out with the hotels control I think that is the towns issue. All in all we've had a great time and have enjoyed staying here. If you get the chance to go up teide then it's amazing.